Over the years I have bought several of HP’s budget servers and have been impressed; they are inexpensive, especially if you look out for “top value” deals, and work reliably. In the past I’ve picked the ML110 range but this is now discontinued (though the G7 is still around if you need it); the main choice is either the small Proliant Gen8 MicroServer which packs in space for 4 SATA drives and up to 16GB RAM via 2 PC3 DDR3 DIMM slots and support for the dual-core Intel Celeron G1610T or Pentium G2020T; or the larger ML310 Gen8 series with space for 4 3.5″ or 8 small format SATA drives and 4 PC3 DDR3 DIMM slots for up to 32GB RAM, with support for the Core i3 or Xeon E3 processors with up to 4 cores. Both use the Intel C204 chipset. I picked the ML310e because a 4-core processor with 32GB RAM is gold for use with a hypervisor. There is not a huge difference in cost. 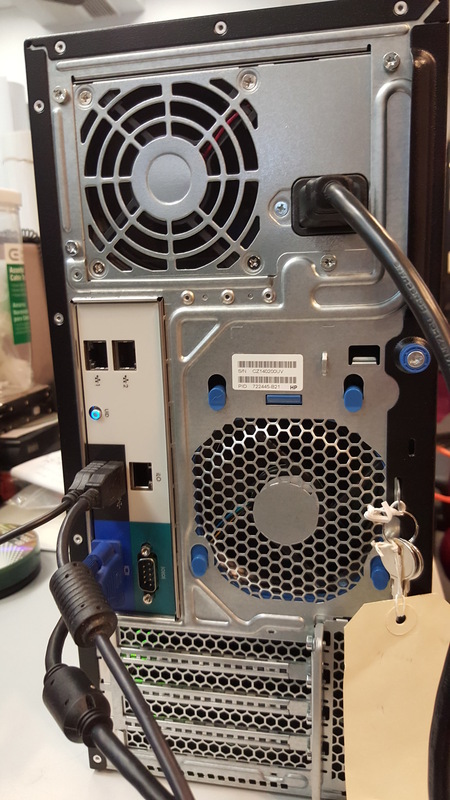 While in a production environment it probably makes sense to use the official HP parts, I used non-HP RAM and paid around $600 for a system with a Xeon E3-1220v2 4-core CPU, 32GB RAM, and 500GB drive. 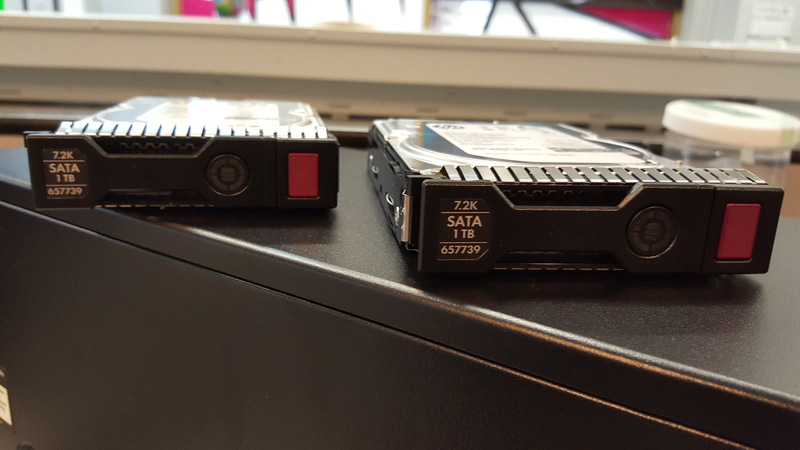 I stuck in two budget 1Tb SATA drives to make up a decent server for less than $800 all-in; it will last five years or more. Will I replace this server? The shift to the cloud means that I may not bother. I was not even sure about this one. You can run up VMs in the cloud easily, on Amazon AWS or Microsoft Azure, and for test and development that may be all you need. That said, I like the freedom to try things out without worrying about subscription costs. I have also learned a lot by setting up systems that would normally be run by larger businesses; it has given me better understanding of the problems IT administrators encounter. You might think that you have to buy HP drives which come packaged in caddies. This is not so; if you remove one of the caddies you find it is not just a blank, but allows any standard 3.5″ drive to be installed. 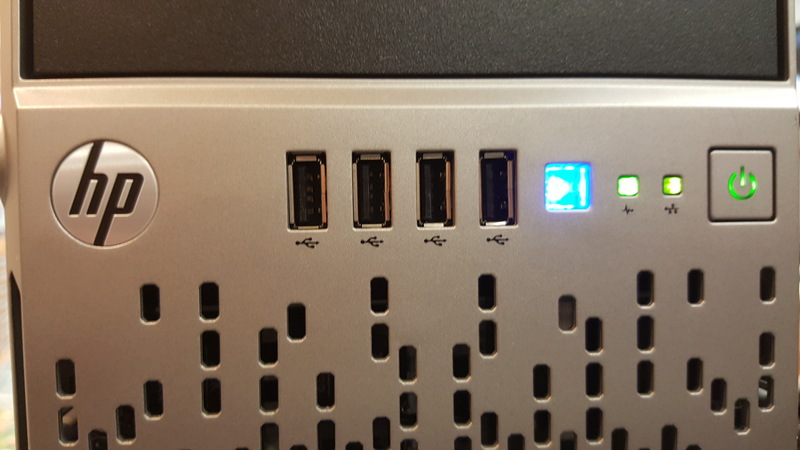 The metal brackets in the image below are removed and you just stick the drive in their place and screw the side panels on. 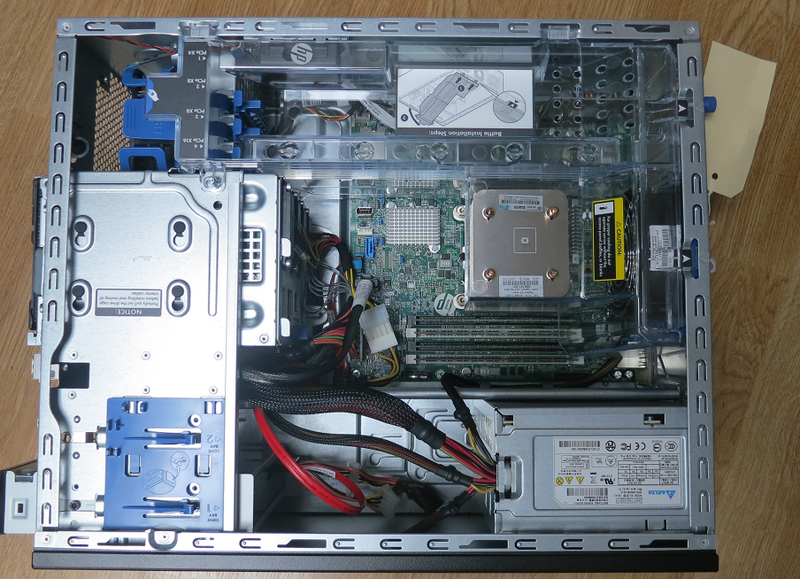 Take the side panel off and you will see a tidy construction with the 350w power supply, 4 DIMM slots, 4 PCI Express slots (one x16, two x8, one x4), and a transparent plastic baffle that ensures correct air flow. The baffle is easily removed. 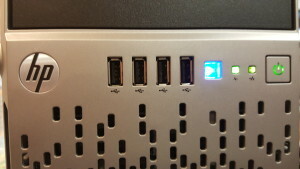 On the rear are four more USB 2.0 ports, two 1GB NIC ports, an ILO (Integrated Lights Out) port, video and serial connector. For the ILO access to the server, the luggage label shows the DNS name you need to access it. If you can’t get at the label, you can look at your DHCP server and see what address has been allocated to ILOxxxxxxxxx and use that. Once you log in with a web browser you can change this to a fixed IP address; probably a good idea in case, in a crisis, the DHCP server is not working right. Everything is fine on the hardware side, and the Windows 8.1 Pro 64bit OS installed with any issues. HP has a system called Intelligent Provisioning built in. You pop your OS install media in the DVD drive (or there are options for network install), run a wizard, and Intelligent Provisioning will update its firmware, set up RAID, and install your OS with the necessary drivers and HP management utilities included. I don’t normally bother with all this but I thought I should give it a try with the OEM Windows 8.1 Pro 64bit disc that was purchased with the HP micro server. 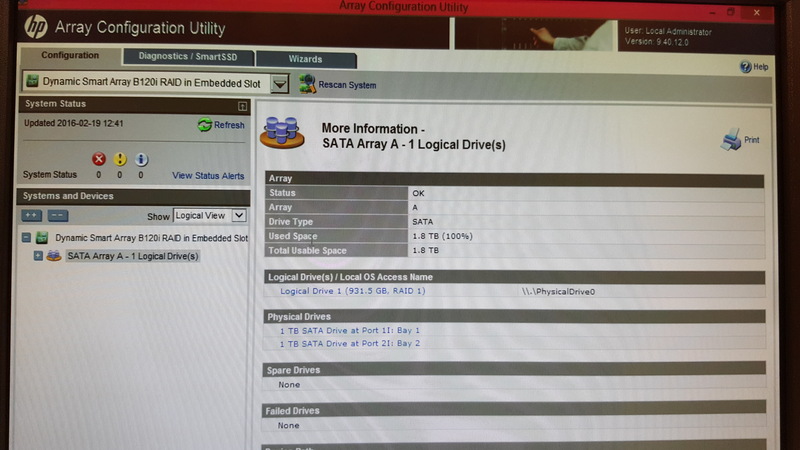 I set up a RAID 1 using two HP 1TB SATA drives using the HP Smart Storage Administrator (ACU / HP SSA) utility. Memory problems? Drive problems? Absolutely none! Install proceeded perfectly with no need for additional drivers, and the OS is 100% stable. 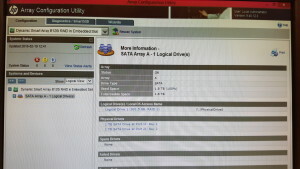 You could also use Storage Spaces to setup a RAID. Storage Spaces in Windows 8 and 8.1 allow combining multiple hard drives or Solid State drives into one storage pool. To create a new Storage Space, you must have at least two physical hard drives (your Windows drive does not count here!) or Solid State Drives. Open Settings search using keyboard shortcut WINDOWS KEY+W, type “storage” into Search box and click Storage Spaces. The HP ML310e G8 v2 server overall is a great investment and comes in at a reasonable price tag. HP makes reliable servers and the ML310e is just right for a small business or home office budget server. This particular unit above was configured in-house at Amvean and shipped to a client who will be using it as their business data server.